Join breweries such as Dog Fish Head, Brooklyn Brewery, Great Lakes, Troegs, Boulder, Flying Fish, Stone, Left Hand, Magic Hat and many, many more as the feature their tasting nectars in the New Jersey favorite play ground. If you really love great beer, this is event is all you. Tell your friends, tell your friends friends.. Spread the word. 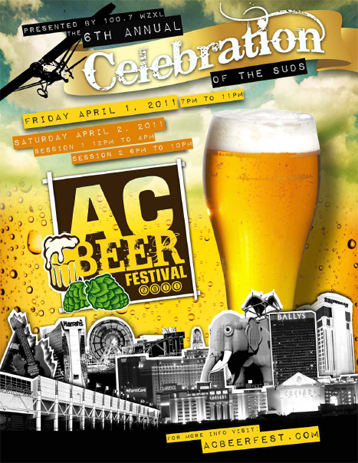 The 2011 event will feature great food, live music, entertainment, guest speakers, and plenty of amazing Beer.. The Festival Starts Friday April 1st with Session #1 at 7pm to 11pm, Saturday April 2nd Session #2 from 12pm to 4pm Session #3 from 6pm to 10pm. We ask festival goers to enjoy but be responsible know your limits and enjoy the brews responsibly.